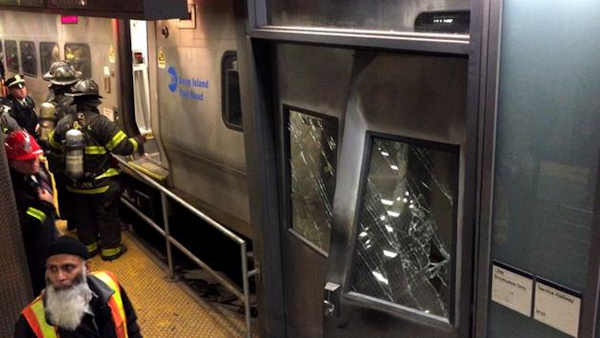 An LIRR train crashed into the end of a platform at Brooklyn's Atlantic Terminal. ALBANY, New York -- Five U.S. senators have called on the National Transportation Safety Board to conduct a comprehensive review of all passenger railroads' implementation of sleep apnea testing for engineers and inward-facing cameras on trains. A letter, sent Sunday to NTSB Chairman Christopher Hart, was signed Bob Menendez and Cory Booker, of New Jersey, Senate Minority Leader Chuck Schumer and Kirsten Gillibrand, of New York, and Richard Blumenthal, of Connecticut. The five Democrats noted that operator fatigue and sleep apnea have been cited in the investigation of a New Jersey Transit crash that killed one person and injured more than 100 others last September in Hoboken. Operator fatigue also is being probed in an accident that occurred Wednesday, when a Long Island Rail Road train a train crashed into the end of a platform at Brooklyn's Atlantic Terminal, injuring about 100 people. "What's even more concerning than the slow progress railroads are making is an apparent growing trend of railroads pledging to implement sleep apnea testing and inward cameras only after a derailment has occurred on their system," the senators wrote in the letter. "Passenger railroads should be able to heed the lessons of other passenger railroads, and each of them should be taking steps to implement these two important provisions as quickly as possible." The NTSB has long recommended sleep apnea testing, comprehensive fatigue risk management programs and inward-facing cameras, which would show inside a train's cab and could give a fuller picture of the operator's actions, not just outward-facing cameras, showing outside the train. The Federal Railroad Administration called last month for mandatory sleep apnea screening and treatment, saying it told railroads that engineers with severe sleep disorders shouldn't be allowed to operate trains until they are treated. It also urged railroads to install inward-facing cameras in passenger train cabs to record engineers' actions and aid crash investigations. Amtrak and some commuter railroads are already testing engineers for sleep apnea. Freight railroads say they also provide access to screening and treatment. Metro-North, a commuter railroad in New York and Connecticut, found that 1 in 9 of its engineers suffers from sleep apnea. People with the disorder are repeatedly awakened and robbed of rest as their airways close and their breathing stops, leading to dangerous drowsiness later. The federal agency first recommended sleep apnea testing in 2004. It's drafting rules that would make screening for all train operators mandatory.